When people think about selling internationally they often imagine sales being one-way traffic to happy customers. Few think up front about the challenges of international returns. A proportion of your orders will always be rejected, for a variety of reasons. Customers have high expectations the world over, and just because you may be thousands of miles away from the consumer, they won’t forgive you for poor service. If you sell on your own web store, maintaining customer satisfaction when handling international returns can be a logistical headache. If you sell through online marketplaces like Amazon or eBay, it’s even more serious. Just a few poorly managed returns could result in bad feedback and complaints, and have serious consequences for the future of your business. But what brought international returns into sharp focus for a lot of sellers were Amazon’s new rules covering international returns that came into effect in March 2015. The key point is that Amazon sellers now need to provide international customers with a local returns address, or provide free return shipping. Driven partly by Amazon’s policy change, a number of new and innovative options for international returns have sprung up this year. In this article I’ll outline what your options are, the pros and cons, and what they’ll cost you. eBay and Amazon have been pushing sellers hard to sell internationally. There is genuinely huge potential in cross-border ecommerce. Shoppers in many parts of the world are willing to buy internationally when products are unavailable – or prohibitively expensive – in their home country. As a consequence, both eBay and Amazon have developed logistics programs to help sellers ship orders internationally. Unfortunately, they fall short when a customer wants to send an order back. A lot of the time, sellers are simply left on their own when it comes to international returns. Here’s the position for each marketplace. eBay developed their Global Shipping Program (GSP) to make it easy for sellers to export, and most agree that it is an excellent scheme. Under the GSP, sellers can send orders to a facility in their own country, instead of direct to the buyer. From there the order is sent with tracked delivery to the customer in one of over 60 countries worldwide. This protects the seller against any delivery-related issues including damage in transit. When selling to an international buyer through the GSP, eBay calculates a single price including delivery and taxes and charges the buyer the whole amount. The cost is made up of three parts – delivery to the national shipping centre, the cost of onward shipping to the buyer, and any applicable taxes and import duties. With a few exceptions, international returns are not supported through the Global Shipping Program at this time. eBay may choose not to display the returns policy field of your GSP listings to international buyers unless you set your returns policy to no returns or exchanges. If you wish to accept international returns, you should describe your international returns policy in your listing description. The FAQs then state that the applicable laws of the country in question still apply, and you should conform to those. Simply stating that you will not accept returns does not override the laws of the countries you are selling to. The UK’s Consumer Contracts Regulations, for example, allow buyers to returns orders for any reason within 14 days of receipt, regardless of which country the seller is based in. The GSP isn’t mandatory for selling internationally on eBay. However, it does make it simpler, particularly for smaller sellers or those just starting out with international sales. What it doesn’t do is help with the handling of returns. Whether you use the GSP or not, you are in just the same boat when it comes to international returns. Where eBay leaves returns policy to the seller, Amazon is absolute in its rules around international customer returns. When listing in an international marketplace and fulfilling items on your own, you must either (i) provide customers with a local return address within the country of their Amazon marketplace website or (ii) offer them free shipment for returns. This is a requirement to sell on Amazon’s marketplaces. There’s no room for interpretation in Amazon’s policy. You have to find a way to do it, or just stop selling on international Amazon marketplaces. It makes a huge difference to the user experience. It also makes a huge difference in the buyer’s mind – ‘Is this person really serious about selling into my country?’ People don’t usually mind buying from abroad, but they do want to know the seller is serious about them as a customer in their country. As well as the logistics costs there are hidden costs. These will include lost customers due to a 3-4 week time period to return the goods and deal with the refund. Processing the goods for re-sale can take another 1-2 weeks, meaning that up to six weeks have gone before they are on the shelves for resale again. These problems can mount up if you are selling internationally in significant volumes. Many businesses could benefit from a local returns service in any country where a large number of customers are buying their products. In the logistics industry, dealing with returns is sometimes called the “reverse supply chain” or “reverse logistics”. Those fancy terms get across one key thing: as your business scales up – and returns increase alongside it – handling them becomes just as important and complex as shipping orders out in the first place. There are several options available to make international returns easier. Some are available to even the smallest businesses, while others scale all the way up to high-volume exporters. Some sellers simply give the customer a full refund without having the goods returned. This approach is simple and potentially cost effective when the products sold are of low value to the seller. The cost of other options, such as paying for return shipping, could exceed the value of the order. One downside is that for mid- or high-value orders this is just not financially viable. Also, a willingness to give products away could send the message that your products are of little value, and reduce the chance of repeat purchases. Worse still, bad buyers would be delighted to hear that there’s such an easy way to get your products for free. There are a number of parcel forwarding schemes in the US and other countries. These are designed to provide individual buyers abroad with a local address so they can order from websites in that country. The service then forwards the packages on to the buyer’s home country. Shipito, for example, will provide a US mailing address for $10 per month. Shipping to your home country is provided at discounted rates, and packages can be consolidated (grouped together) to save further. Consumer parcel forwarding services are a viable option for sellers with a low volume of international returns, and do meet the requirement for a local returns address. The main downside is that these services are not designed for commercial use. They may have spending and volume limits, and can be relatively expensive compared to other options. The supplier might not allow business use. Major international carriers like DHL, TNT, FedEx and UPS can transport packages between most addresses worldwide. If these massive logistics companies can’t arrange the return of a parcel back to your country, it’s doubtful that anyone can. They pride themselves on their reliability, but the downside is simple: their services are expensive, particularly for ad-hoc international shipments. In many countries, you can also buy international postage labels online from the national postal operators. The UK’s Royal Mail online postage shop can be found here and the USPS equivalent can be found here. Postage can simply be printed to a PDF then emailed to the buyer so they can return the package easily. The cost can be borne by the seller to meet Amazon’s requirements, or deducted from the refund where a free return is not mandatory e.g. for eBay sales. While national postal services may be cheaper than international parcel carriers, many sellers report lower reliability and unexpected custom charges. Parcels are handed off to local carriers in the destination country, meaning that packages are often no longer tracked once they arrive in the country. But national postal operators around the world are improving their ecommerce services, recognising ecommerce sellers as a major market. For example, Germany’s Deutsche Post is working on their international delivery service for ecommerce by offering RFID tags to track outbound parcels for medium-value items, though this won’t be extended to returns for some time. The cynical among us may come to the conclusion that Amazon’s strict rules on international returns will make a lot of sellers go into the Fulfillment By Amazon (FBA) program! Using FBA, Amazon will store your items in their warehouses and send them out to buyers as the orders come in. As part of the deal, you will automatically have the required local returns address, and not have to worry about the rules imposed by Amazon. Amazon will also handle customer service enquiries and your products will get the Prime badge, capturing the attention of millions of Prime members around the world. However, FBA charges a fee for just about everything you can think of. Not all sellers have the profit margins to afford it. The fees are even higher if you use FBA for orders that don’t originate from the Amazon marketplace, known as Multi-Channel Fulfillment (MCF), meaning that many sellers still need to find a returns solution for non-Amazon orders. Also watch out for FBA Export fees (only accessible with an Amazon Seller Central login) if you are using FBA to sell directly across borders, as opposed to within the same country as the FBA warehouse. Returns consolidators are businesses with warehouses in a number of countries around the world. For a fee, they will provide a local returns address, meeting the demands of Amazon but also helping you to work with alternative local marketplaces. They’re not unlike the consumer-level parcel forwarding services, but in this case they are firmly geared toward ecommerce businesses. You would send out returns labels in PDF format to those three buyers. Each of them would print out the label, stick it on their package, and bring it to their local Post Office, DPD or Hermes, whatever it is. All the packages would then go to the local returns address in their respective countries, and then get forwarded to one UK hub warehouse where they are consolidated into one box. Either every week or every month that consolidated box is sent back to the seller. The main advantage of international returns consolidation services is much lower shipping costs. InterCultural Element’s Global Returns service achieves this by shipping parcels for multiple sellers between their international warehouses in bulk, then consolidating them again for each seller once in their home country. The service has a €19.95/month base subscription fee, a per-parcel international forwarding fee starting at €2.45, and a fee for each weekly or monthly consolidated box starting at €6.95. Those are dramatically lower costs than shipping each parcel internationally. These services can be suitable for the full range of businesses from SMEs to large enterprises. There are downsides however: providers might not have warehouses in every country (InterCultural Elements does not serve the US, for example), and you won’t know if the product is in good condition until it makes it all the way back home. Other international returns management providers include Salesupply, ReBOUND and Asendia. A new returns management service provider, ZigZag Global, has been trading for less than a year, but already has major ecommerce clients on board as well as serving smaller marketplace sellers who are trading internationally. They have a range of options for international returns, including consolidation and forwarding, but have also innovated by offering an option to resell returns locally rather than sending them all the way back to the retailer. If goods are sent to Melbourne, Australia, the customer can return them to our warehouse in Sydney which might take two days, against one to two weeks to return them to the US or UK. ZigZag can then resell those goods via eBay Australia and give the sellers back some cash. The company also offers a re-fulfilment scheme. A-grade returned items can be retained in the destination country, and used to fulfil other orders from local buyers. So what are the advantages of this approach? One is the speed of processing returns. By removing the need to ship orders all the way back to the seller’s country for inspection, refunds can be processed within days, which improves customer satisfaction. Another advantage is reducing the cost – in time and money – of processing returns. Often the greatest cost of returns is the labor involved in inspecting, repackaging and returning products to stock. All of that is avoided if returned products are resold by a local service provider. The only other company we have found providing the option to resell returns locally is Purolator. However, this company specializes in logistics between the US and Canada, and only handles returns between those two countries. International returns are one piece of the cross-border ecommerce puzzle that is often forgotten. For smaller sellers just starting to sell internationally, it’s rare that they give much thought to it. But as the demand from international buyers continues to rise, and more businesses start competing for their share of the market, this problem will surface a lot more. Increasing expectations from buyers and marketplaces only add to the pressure. But there are options. For sellers of low-value items, with little time to spare, just writing it off can be a practical strategy – even if it leaves a bad taste in the mouth. For those who only sell on Amazon, and can afford to use FBA exclusively, there isn’t too much of an issue. 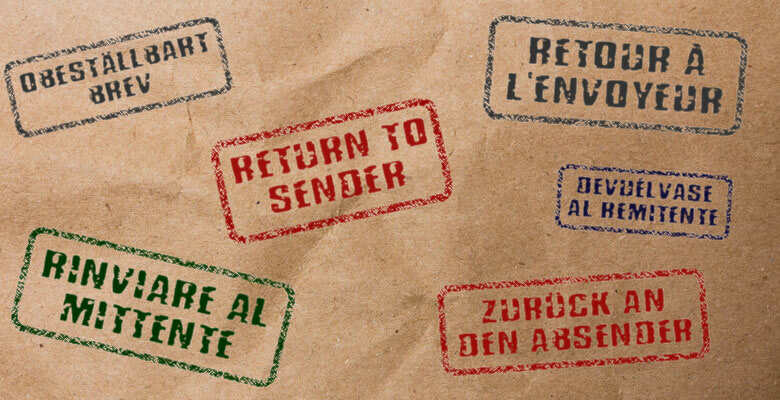 Likewise for those selling through other channels, but only to countries where returns aren’t required by law, and whose sales and reputation aren’t damaged by refusing to accept returns. You’re lucky if you’re in that camp! That leaves a lot of sellers in need of a more sophisticated approach. Consumer-level parcel forwarding services, or simply arranging return shipping with an international carrier, can be a practical solution, with the potential downsides of being time-consuming, slow and expensive. Finally, the really ecommerce-focused services – those which consolidate returns or resell them locally – can reduce shipping costs and the administrative overhead dramatically, providing robust solutions for businesses with a larger volume of international returns. Returns management is a difficult business. International returns dial the complexity up even further. But for those who really want to succeed with cross-border ecommerce, it’s a problem that must be mastered. Those who do master it can get a real advantage over their competitors, and that is always worth having. Interesting read and mostly recognizable. We, at Cycleon, are specialists in Returns Management and takes care of the cross-border returns for Nike, Amazon, Superdry, Sony and the likes, providing portals, interfaces, local return centres, grading services (so the retailer can issue a refund within 48 hours) and consolidation models (express, economy and everything in between). Just remember, a return is significantly different from a delivery and has a big impact on total cost of ownership: its not just a cost of a parcel! It impacts your CS, your purchasing, warranty, warehouse handling, service contracts, carrier contracts and management, labels, IT, tracking, restocking, etc etc. So its also important to talk to a reverse logistics / returns management specialist, rather than a (simple) consolidator or postal organization offering “return services”. Spring have a tried and tested Returns solution for packets and parcels from Europe and also USA, either via a single return PO box address in Netherlands or to a local in country PO Box. We offer economy non tracked or a tracked feature. We consolidate and return a consignment of items at prearranged intervals to anywhere in UK or Europe.We have also now introduced a “sender pays” portal where you can ask for a payment to cover the cost or, proportion of the cost of the return. Hi Sebastiaan and Ian, thanks for the comments. We don’t usually allow suppliers to promote their own services here, but as this post already mentions other service providers, and vendors who handle international returns are somewhat hard to find, we’ll relax that rule for this post. Other international returns service providers are welcome to post, just keep it factual please. A Great article thanks. I actually started an international returns business in Europe alongside my e commerce business in April 2015 after the Amazon policy was introduced. Being a seller we knew the problems facing retailers as explained here, so came up with a very simple and cost effective returns handling solution that even small sellers or those starting out can use effectively. We are now on the look out for a partner who can work with us to provide a solution in the USA & Canada and would be really interested to hear from any businesses that may be interested in adding an income stream to their existing core business. Our partners in Europe include other e commerce businesses and logistics companies. There’s another cheaper and more innovative way to handle the returns. Why can’t the return be consolidated and sent to an amazon warehouse for reselling? Why is no one providing that service? A good point and a service we have recently begun offering ourselves in selected countries including USA, Germany, UK & France. As well as sending returns to sell through FBA we are also offering Re sell of returns through our own fulfillment service so you can re list your re sellable returns without shipping back to the retailer and we will pick, pack & ship, again saving time & money and turning returned stock into cash quicker for retailers. I am very interested in such service can you tell me where to find such service? Thank you Andy so much for your quick reply. I contacted them and already setup the return service in less than 24 h. My international returns was putting lots of pressure on my service quality but now I already feel relieved. Glad we could help and sure you will find your returns handling a lot easier now. Thank you Andy too.